You Are Here: Home > 2018 Jeep Cherokee – Colorado Springs CO.
2018 Jeep Cherokee – Colorado Springs CO. The 2018 Jeep Cherokee continues this popular model’s tradition of great off-roading capability, an extensive range of safety and convenience features, and a plethora of options to fine-tune the vehicle to the buyer’s liking. Firmly planted in the Cherokee’s fifth generation design, the 2018 version offers a few tweaks and upgrades without drastically changing the overall specifications of the vehicle. The Cherokee is a solid crossover SUV that is equally at home on or off the road. With engine options that range from the four-cylinder, 2.4L Tigershark to a six-cylinder, 3.2L powerhouse that offers 271 horsepower, the Cherokee has something for everyone. The different FWD and AWD options are available on all five of the major trims so buyers can pick the drivetrain they need for their style of driving. The SUV’s five trim levels offer a variety of interior/technology upgrades including common touches such as leather upholstery, heated seats, and Jeep’s UConnect infotainment system. For true off-roaders, the Trailhawk package makes many off-roading features standard including a lifted suspension, intelligent all-wheel drive with extra traction control, and skid plates for extra protection. Combined, the different options and features of the 2018 Jeep Cherokee make it easy to find what you are looking for in an SUV starting at $25,490 here in Colorado Springs CO.
Jeep has included many of their standard and optional safety features into the 2018 Cherokee, starting with a seven-airbag system that includes multistage driver and front passenger bags. Side-curtain and knee bolster airbags also provide extra protection for the front passengers during a crash. Front and rear crumple zones will protect the interior cabin during high-speed accidents. Additional safety systems such as blind spot monitoring and forward collision prevention come in two main packages: the Technology Group package available on the Limited, Overland, and Trailhawk trims, and the lesser Safety Tec package. The base safety package includes Jeep’s blind spot monitoring system and rear parking sensors. This package provides enough sensor coverage to alert the driver of hidden dangers around the SUV. The Technology Group Package offers more safety and convenience features at a higher price point. In addition to parking and blindspot sensors, the package comes with Jeep’s intelligent adaptive cruise control with forward collision detection that kicks in whenever the possibility of a front collision is detected. The parallel/perpendicular parking assist helps the driver identify open parking spots and then provides parking instructions while controlling the gears, brake, and accelerator. The Cherokee retains many of the same design features as previous versions of the fifth generation. Small details like the front grill and headlights, along with the rear lights, received some minor tweaks in appearance. The biggest change, however, is the restructuring of the available trims. Losing the popular Sport baseline trim, the line now comes in five major trim families: Latitude, Latitude Plus, Limited, Trailhawk, and Overland. The Latitude serves as the Cherokee’s baseline model for people wanting a simple, more affordable setup. Starting at $25,490, the trim features 17in aluminum wheels for a small degree of weight saving performance. On the front, this version comes with the high-intensity discharge headlights, fog lights, and daytime running lights. On the inside, a 5in touchscreen controls the six-speaker audio system, rear view camera, trailer sway control, and Bluetooth connectivity. The Latitude Plus retains much of the same design and performance of the base model. Most of the upgraded features are on the inside which include a larger 8.4in touchscreen with Amazon Alexa compatibility, satellite radio, keyless entry, and leather seats/steering wheel. This trim also offers more storage space with the addition of a front passenger fold-flat design. The Cherokee’s Limited trim adds many creatures comforts to the interior of the car for people wanting more. Leather upholstery, dual-zone climate control, and a heated steering wheel make the interior more comfortable for the daily commute or long trips alike. Safety upgrades include blind spot sensors, rear parking sensors, and an automatically dimming rearview mirror. The wheel’s increase to 18in in diameter for a small performance boost. The Trailhawk is the upgraded, off-road oriented, trim that changes the SUV’s overall handling and ground clearance for better performance. The off-road-specific suspension increases the height by an inch so the vehicle gains a total of 8.7 inches of ground clearance. The sophisticated all-wheel drive will monitor wheel/traction performance for better control while driving on challenging terrain. The top-of-the-line Overland package, starting at $35,190, has an upgraded look with matching colored fascias and cladding. The trim retains the Limited’s 18in wheels with a polished alloy finish. Inside, the front seats are powered and heated. The controls are adorned with wood on the steering wheel and leather upholstery on the dashboard. 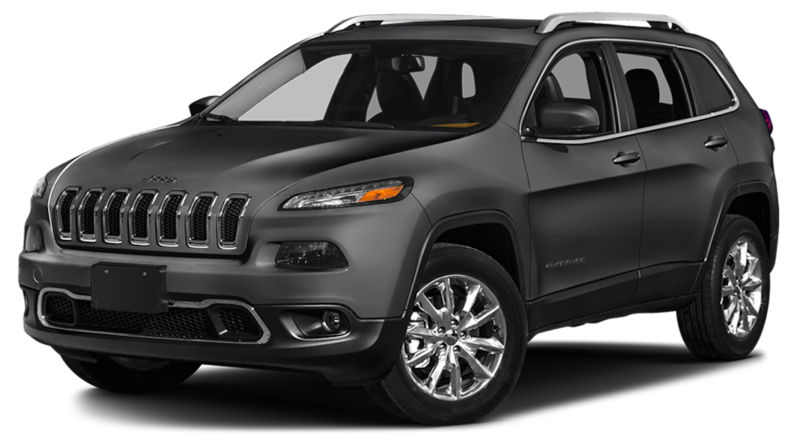 Many of the Cherokee’s optional systems such as adaptive cruise control, blind spot monitoring system, and automatic braking come standard in this package as well. The 2018 Jeep Cherokee comes with two engine options for fuel economy and performance conscious buyers alike. The standard four-cylinder 2.4L Tigershark engine improves engine performance and fuel efficiency so drivers can maximize the range of the SUV. With a fuel rating of 21/30 MPG, the engine comes with 184 horsepower. The 171 pound-feet of torque brings a maximum tow capacity of 2,000 pounds as well. For people who find four-cylinder engines to be a little sluggish and underperforming, the V6 3.2L engine upgrade has more power to offer. The six-cylinders will provide up to 271 horsepower with 239 pound-feet of torque. The average towing capacity increases to over 4,500 pounds, making this engine the preferable choice for people needing more hauling and acceleration performance. All of the Cherokee trims come with either FWD or all-wheel drive options. The FWD drivetrain is the standard choice but may lack the extra traction for serious off-roading or challenging driving conditions. The all-wheel-drive uses Jeep’s Active Drive II system to provide additional torque and traction during travel conditions that commonly cause wheel slippage and increase the risk of an accident. The system also includes various driving modes for conditions like snow and off-roading to change the handling without forcing the driver to adjust to the changes. Come On Down to The Faricy Boys Chrysler Dealership in Colorado Springs, CO. The Faricy Boys have what you need when it comes to finding the perfect new or used vehicle. Featuring our competitive, no-haggle prices, our vehicles are easy to find, test drive, and take home anytime you need to make a purchase. Since you are a valued customer, we treat your priorities as our number one issue. The task of finding the right, affordable vehicle couldn’t be easier on our lot. From buying a car to getting it serviced, we do it all. Our staff is friendly and knowledgeable so you can get all the help you need in one location. Since we’ve been around the block for a year or two (try 75 years), we know how to get you the guidance and help you need right away without any hassle. Faricy Boys is all about quality customer surface so you don’t have to worry about the usual challenges of finding and buying the right car. You are our number one priority. For a 2018 Jeep Cherokee in Colorado Springs, CO, visit our dealership today.